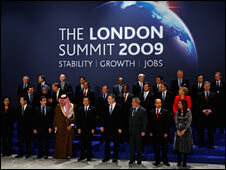 The G20 summit in London agreed on a plan to fight the global economic crisis and provided a down payment of $1.1 trillion to support developing economies during the crisis. The French and Germans despite much rhetoric and play acting of threatening to 'walking out' signed on the dotted line, as I stated they would in an earlier article, as the consequences of a failure of the summit would literally mean Financial Armageddon. Whilst Gordon Brown may have helped to save the global economy from an economic depression, unfortunately I doubt anything he does will make any difference to the outcome of the next UK general election which spells defeat for the Labour government. We start from the belief that prosperity is indivisible; that growth, to be sustained, has to be shared; and that our global plan for recovery must have at its heart the needs and jobs of hard-working families, not just in developing countries but in emerging markets and the poorest countries of the world too; and must reflect the interests, not just of today's population, but of future generations too. We believe that the only sure foundation for sustainable globalisation and rising prosperity for all is an open world economy based on market principles, effective regulation, and strong global institutions. The markets reacted positively with stocks soaring, which was precisely inline with the expectations for the stealth bull market. However the U.S. Dollar reacted negatively to what appears to be a program that calls for a co-ordinated devaluation of the dollar so as to ignite inflation. Clearly the deployment of $1.1 trillion is positive for the global economy with more expected later in the year which means that economic forecasts will need to be revised towards a more favourable and inflationary 2010. However, I do see a potential problem in that the exporting economies of Germany, Japan and China are still hooked on the American's and Brit's buying their products and therefore looking for the old economic model of consumption to resume. However, President Obama's comments clearly indicate that he wants to seek to put the U.S. Economy on a stronger long-term footing which means less consumption and more production. "In some ways the world has become accustomed to the United States being a voracious consumer market and the engine that drives a lot of economic growth worldwide. And I think that in the wake of this crisis, even as we're doing stimulus we have to take into account our own deficits. We're going to have to take into account a whole host of factors that can increase our savings rate and start dealing with our long-term fiscal position, as well as our current account deficits. Those are all issues that we have to deal with internally, which means that if there's going to be renewed growth, it can't just be the United States as the engine." From what I can garner form the text, despite the rhetoric, additional regulation of the shadow banking system looks set to be pretty weak as rather than a global regulator actual changes are left to respective governments. The original forecast for the UK economy as illustrated by the below graph is for a peak to trough contraction of -6.3%, today's summit communique improves the outlook marginally, however there is plenty of time to make potential adjustments as the contraction of 2009 has still some way to go.